When you seek legal assistance at one of our Help Desks, you will be able to meet with an attorney on the spot. This volunteer will help you begin the process of solving your legal problem. This may also include representing you in court through the duration of your case. Volunteer Lawyers Birmingham provides a free service to assist low-income residents with their legal needs. Your Help Desk visit is a one-time engagement with an attorney volunteer donating their time. Should you return after your first visit, you may be seen by a different attorney volunteer. Some clients may receive extended legal representation, which is determined on a case-by-case basis by VLB staff. Every Monday and Thursday morning, you can find VLB at the Jefferson County Courthouse helping residents of the greater Birmingham area with civil legal issues: wills, small claims, landlord-tenant issues, and more. Please click here for a complete list of issues VLB can assist with at our Civil Help Desk and how you can receive assistance. If you’re an attorney who would like to volunteer at the Help Desk, click here! Every Wednesday morning, you can find VLB at the Jefferson County Domestic Relations Courthouse helping residents of the greater Birmingham area with domestic relations legal issues like divorce, child support, and custody. VLB also manages a special pro se court docket for low-income clients on the second Friday of each month. If you need assistance with a domestic relations legal issue, please check out this page about our Help Desk. If you’re an attorney who would like to volunteer at the Help Desk, click here! Once a month, on the first Tuesday, VLB has a special Help Desk for homeless clients at One Roof, which is a partner organization of VLB that is dedicated to ending homelessness. 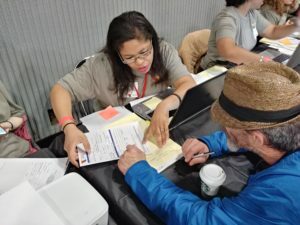 Our volunteers assist homeless clients with a variety of legal issues, but typically the most common area that VLB assists with is resolving legal barriers to gaining a form of legal identification. If you or someone you know needs assistance, you can click here for more information. If you’re an attorney who would like to volunteer at the Homeless Help Desk, click here! On the second and fourth Wednesday of each month, VLB has a special Help Desk for veterans at the Birmingham VA Annex. 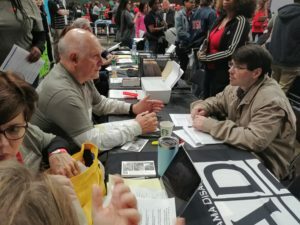 Our volunteers assist low-income veteran clients with any legal issue that they may have, whether pertaining to their service or not. If you or someone you know is a veteran who needs legal assistance, you can click here for more information. 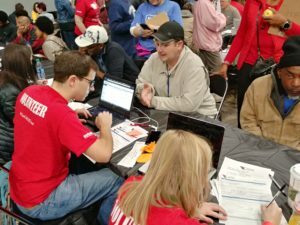 If you’re an attorney who would like to volunteer at the Serving Veterans Help Desk, click here! 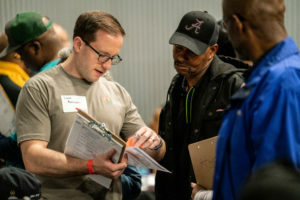 Volunteer Lawyers Birmingham (VLB) is the only non-profit in the state of Alabama that provides immediate access to free high-quality attorneys so low-income families can obtain critically needed legal services. Add me to the weekly newsletter subscription list.